“I wish I had money,” Tom Rakewell sings in “The Rake’s Progress” just before these five short words begin to dismantle his life. 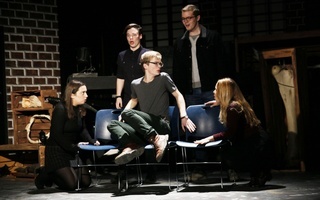 Produced by Harvard College Opera and the Office for the Arts at Harvard, Igor Stravinsky’s classic opera ran from Feb. 3 to Feb. 6 at the Agassiz Theater. This interpretation of “The Rake’s Progress” effectively combined expressive acting, strong musical performances, and technical ingenuity for an entertaining and impressive opera. 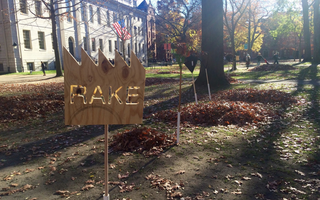 “The Rake’s Progress” depicts the story of Tom Rakewell (Andy J. Troska ’17), a young, lazy dreamer who hopes to live life with no worries and to stumble upon the means by which to live it. This wish is miraculously granted when a mysterious uncle dies and leaves Tom a fortune, brought to him through his new servant, Nick Shadow (Eric Ritter of Boston University). Nick leads him to desert his true love, Anne Trulove (Asia T. Stewart '18), under the pretense of needing him to take care of legal procedures to secure his fortune. However, Shadow first takes him to a brothel, which begins his descent into dissolution, dissatisfaction, and distress. While the plot is rather simple, the actors used it as a basis to show the range of their singing and acting abilities. With emotive performances, the actors gave their characters depth and conveyed more than a simple story. Troska’s anguished songs and closing despair showed that behind his character’s seemingly fulfilling life of thrill-seeking and debauchery lay an element of guilt, loss, and unhappiness. Likewise, in Anne’s aria, “No word from Tom,” Stewart heartbreakingly portrayed romantic abandonment and concern for a loved one. 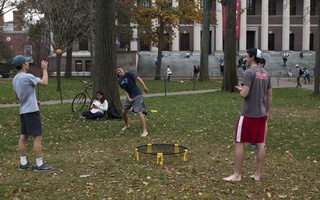 In contrast, Randa R. Melhem ’16, as Tom’s new, bearded wife, Baba the Turk, provided comedic relief. Director Joule P. Voelz ’17 excellently staged Troska and Melhem’s dynamic as husband and wife, as Melhem nags at her husband to the point where he has to silence her. Her superb singing and success in capturing Baba’s chattering nature and exasperation gave a lighthearted and memorable twist to the show. The opera was further bolstered by its technical elements. Working with little scenery, the crew expertly transformed each prop to fit the scene: The same small table helped create the settings of a country home, brothel, and fashionable apartment. This cleverness extended to the lighting, designed by Kathleen Zhou ’17, which mainly took the form of a colored screen in the background, which filled the entire stage with red to convey danger, pink or green for happiness, or blue for sadness. The students behind “The Rake’s Progress,” from the accompanists to the actors and staff, took up the challenges of Stravinsky with memorable aplomb. Aiming high and executing confidently and creatively, the show was truly opera done well.